This is a dish I had at a restaurant some years back during a trip to New Orleans. There is something about Cajun/Creole food I absolutely love. Maybe it’s because the flavors are big, bold and comforting at the same time. Some think that all Cajun food is spicy, but that is not completely true. Like other cuisines, you can always adjust the spice level to your liking. The Creole seasoning recipe given here I would say the level of spiciness is medium. Feel free to use red snapper or drum fish for this recipe if you do not have catfish. Enjoy! Season the fish with half of the seasoning mix and set aside. Melt 3 tablespoons of the butter in a skillet over medium high heat and cook the fish flipping once until it is cooked through. Set the fish aside and keep it warm. Add 3Tbs of butter to the skillet and then put the mushroom in the pan and cook them until browned, about 3-4 minutes. Add the rest of the seasoning mix, plus the garlic, scallions, and taste to see if you need to add the kosher salt. Simmer until scallions and garlic is soft 3 minutes. Add the shrimp and stock and cook until shrimp are cooked through, about 3 more minutes. Remove from the heat and whisk in the remaining chilled butter & 1 Tbs of the parsley until you have a smooth sauce. Pour the sauce over the fish and garnish with remaining parsley. Serve with hot sauce of your choice. Bon Appetit! 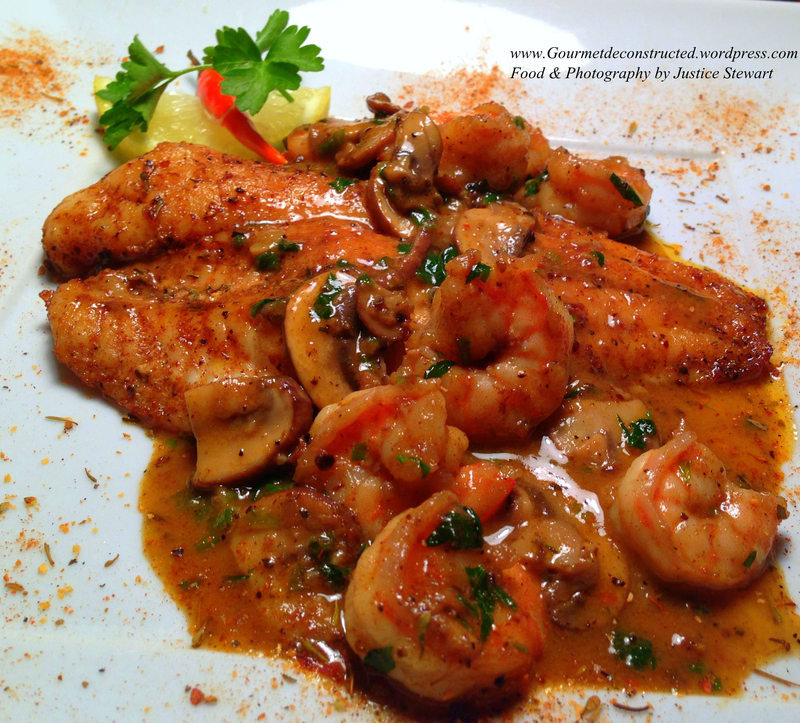 Posted on March 8, 2016, in Seafood and tagged cajun, cajun recipe, catfish, cremini mushrooms, creole, creole food, creole seasoning, new orleans cuisine, New orleans food, seafood, shrimp, shrimp diane sauce. Bookmark the permalink. 3 Comments. This tastes wonderful on the palate and will be passed on! Have no catfish but can get snapper 🙂 ! Would love to try with ‘live’ garlic, onion, thyme, basil and oregano . . . .to each their own proverbial way!! My name is Pinka and I’m the Creative Writer of IDNtimes. IDNtimes is the leading online media company, which delivers worth-sharing content to young generation in Indonesia. Last month, we booked 8 millions users and 30 millions pageviews.